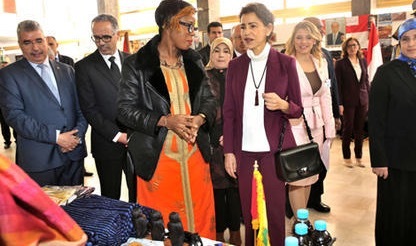 Princess Lalla Meryem presided over in Rabat on Sunday the inauguration ceremony of the Diplomatic Circle Charity Bazaar, held under the high patronage of HM King Mohammed VI. Addressing the opening ceremony on behalf of the diplomatic missions, the spouse of Hungary’s ambassador in Rabat Szilvia Tomler Visihanyo thanked Her Royal Highness for her strong support for social projects undertaken by the Circle. A long established custom that has become an opportunity for the celebration of the warmth of our souls, diverse ideas, culture and traditions, which will attract thousands of visitors. She also voiced her gratitude for Her Royal Highness for this precious help meant to assist poor women and children, underlining that the bazaar brings together several countries, organizations and associations representing different religions, histories and cultures working towards the same goal: helping underprivileged women and children. The Diplomatic Bazaar 2017 edition was marked by presenting to Her Royal Highness a preview of the Children International Circle, which includes around 40 kids aged 8-16. These children are driven by a spirit of solidarity to share ideas that could lead to conducting charity projects during their stay in Morocco. The bazaar is an annual event organized by the Diplomatic Circle in Morocco to celebrate friendship and solidarity, an important means to support Moroccan NGOs involved in the fields of education, health and women’s development in rural areas. Over 30 countries are taking part in this edition via their ambassadors, with the Moroccan club of ambassadors’ spouses and the diplomatic foundation as guests of honour. The annual bazaar is a multicultural event where participating countries showcase an artistic segment of their nation’s culture through the exhibition of numerous traditional artifacts, handicrafts, handmade accessories, articles of clothing and traditional food items which reflect a nation’s identity. An extravaganza of traditional food, clothing, accessories and everything else from many countries across the world, organised by very dynamic diplomatic spouses wanting to raise funds to support various charities in Morocco. Colors of the national flags of the member countries welcomed the guests. Distinguished guests, business representatives and guests from the diplomatic community relished the cross-cultural presentations during the the well organized event offered a rich experience of different cultural activities. Culture, heritage and arts are doing what politics fail to achieve , bringing world countries together side-by-side under one roof. A large number of embassies in Rabat convened on Sunday at this Diplomatic Bazaar, an annual event that has become one of the most popular events in Morocco. The bazaar manifests the concept of social responsibility that these missions are committed to translating. Each of the embassies taking part in the event showcased the finest products from their countries, depicting a rare scene of the world coming together for a noble cause. Princess Lalla Meryem, along with ambassadors and visitors, toured the bazaar’s stalls at Mohammed V theatre in Rabat.